direct injection box when used in bypass mode. balanced mic input of a mixing console. ADI21 is a natural choice for those who are seeking great tone with a simple set-up. (1) The TREBLE control governs the high-frequency range of the signal (±12 dB). (2) The BASS control allows you to boost/cut the low-frequency range (±12 dB). (3) Use the MID control to boost or cut the mid-range frequencies (±12 dB). (4) The LEVEL control adjusts the output level of the ADI21. (5) The BLEND control activates the integrated tube/microphone emulation circuitry. of compression, simply turn the control counterclockwise. this can eliminate hum or ground loops. microphone input of the mixer channel. mic channel lights up frequently or remains lit. functions solely as a standard transparent DI box. (9) This LED illuminates when the eect is activated (see (8)). acoustic guitar or other instruments. balanced XLR (microphone) cable to connect the driver to a mixing console. (12) The unbalanced ¼" TS OUT connector sends the signal to your guitar amp. (13) SERIAL NUMBER. The serial number of the ADI21 is located at the bottom. (14) BATTERY COMPARTMENT. Open the lid to install or replace the 9 V battery. 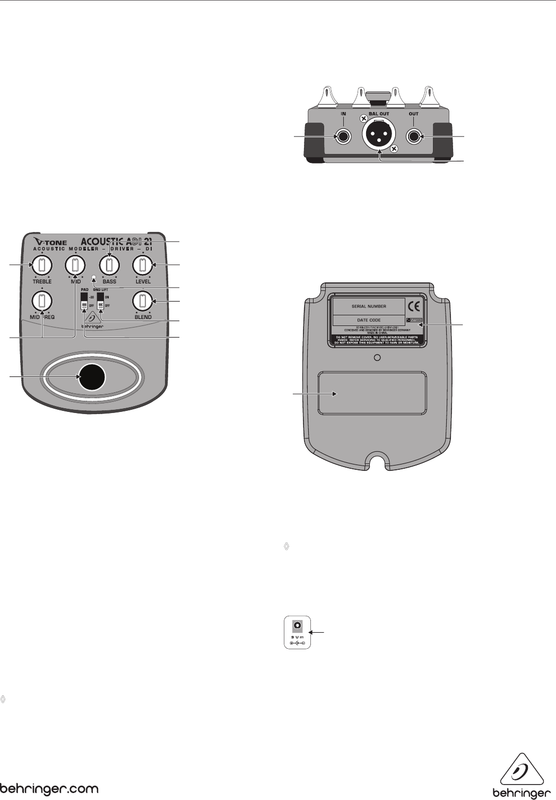 ◊ The ADI21 is powered as soon you insert a plug into the INPUT. The battery is “disconnected” when the plug is removed. (15) Use the DC IN connection to plug in a 9 V power supply (not included).